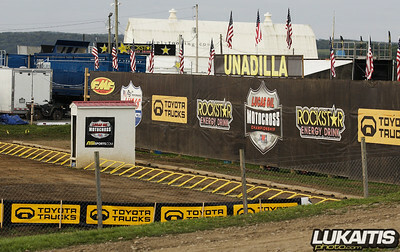 For 40+ years the name Unadilla has been synonymous with motocross. 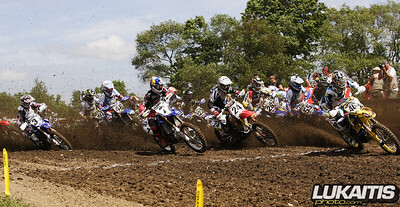 On the site of a one-time dairy farm, the Robinson family and Unadilla have hosted top-notch motocross racing and 2010 didn’t disappoint. Making his return to outdoor motocross after a break in outdoor racing action L&M Racing Yamaha’s James Stewart was back. Going into the day there were many questions to be answered…would Dungey roll over and let Stewart by focusing on the championship rather than a single event or would he show Stewart what he can expect next year at Round 1 of the Supercross Series in 2011? Outdoors only?? JS7 is back. The Rockstar/Makita Suzuki of Ryan Dungey was the first bike across the stripe grabbing the holeshot and setting the early pace. Stewart meanwhile was in a battle with the GP star Clement Desalle eventually working his way around the visiting Belgian racer. With Dungey out front, Stewart began to close the gap a bit but a mistake cost him second place as Desalle got by when Stewart was on the ground. At the moto end, it was Suzuki 1-2 with Dungey, Desalle, and Stewart rounding out the top 3. Muscle Milk/Toyota/JGR/Yamaha Justin Brayton grabbed the moto #2 holeshot but his lead was short lived as Red Bull Honda’s Andrew Short. 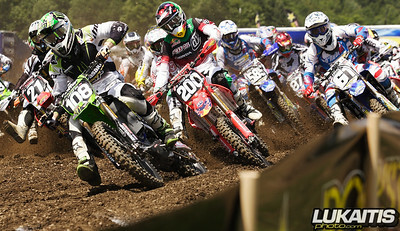 Meanwhile back a little further Dungey and Desalle were locked into a battle. 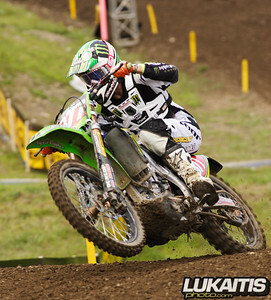 Desalle took the point early and would drag their battle past Short. Stalking Desalle, Dungey carefully studied his lines and got around the #463 Suzuki. He then set off to pull away and leave everyone else behind. By the end of the moto it was again Dungey out front with Desalle in second and Geico Powersports Honda backed Brett Metcalfe in third. Dungey’s 1- gave him the overall followed by Desalle and Metcalfe rounding out the top 3. Dungey’s dominating performance gives him a 111 point lead with 3 rounds remaining. 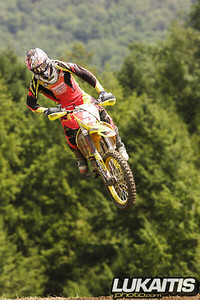 250 Class racing was a Pro Circuit vs. Geico Powersports battle. 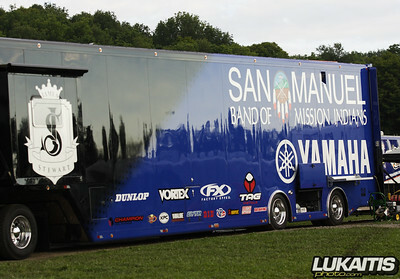 The PC team struck first with Dean Wilson out front but his teammate Christophe Pourcel was quickly by. Then Pourcel was down. His high-speed crash caused a first moto DNF thus throwing the series point standing in chaos. Wilson was back out front with the Geico teammates Justin Barcia and Trey Canard stalking him. Barcia would eventually get by Wilson with an aggressive racing move knocking Wilson over the berm and causing him to go down. The pressure of running up front would eventually get to Barcia and he would make a mistake and go down allowing Canard and Blake Wharton by. Canard would take the moto victory followed by his 3 teammates Wharton, Barcia and Eli Tomac rounding out the top 4. Wilson was again the man out front but he was quickly displaced by Canard. 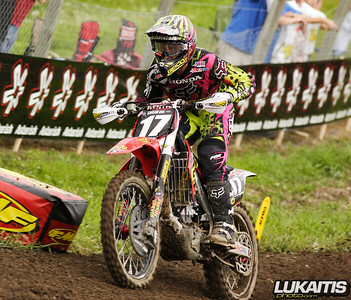 The first moto winner started to check out on the field while Pourcel and Wilson battled tooth and nail for position. 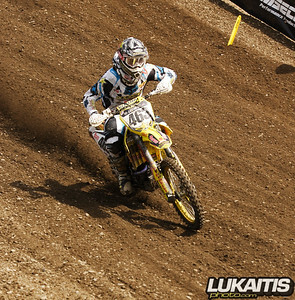 Then with only a couple of laps remaining Pourcel made the move on Canard taking the lead and moto win. Canard Settled for second with Wilson in third. Canard 1-2 moto scores gave him his 4th overall win in a row followed by Barcia (3-5) and Dean Wilson (6-3) rounding out the podium. Pourcel still holds the points lead but it is down to 16 with 3 rounds left.